Beaumontia grandiflora is a magnificent scrambling plant native to Subtropical India. 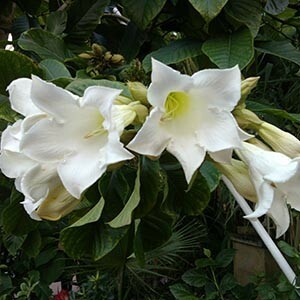 It has large evergreen leaves and large, white, fragrant, trumpet – shaped flowers which can bend down the branches with their weight! As Beaumontia can attain up to 5m or more in height, it is definitely not suitable as a house plant and is only suitable for the largest of conservatories or glasshouse. Beaumontia is named after the Beaumont’s family who lived at Bretton Hall, Yorkshire. Come and see ours in flower now in the Subtropical House.